Though I am still away from home, I am enjoying every minute of the time with my girls (my daughter and two granddaughters). It is like a total girl power party every night (no offense to my dear son in law). And with Mother’s Day coming up on Sunday the 6th of March (only for my UK and Irish Peeps, as the American one isn’t until May) I thought why not celebrate this week’s Woman Crush Wednesday with a perfect ‘mother to be’ honoree? AND recreate her ultimate recipe for what could be a centerpiece dish for a Mother’s Day Brunch! 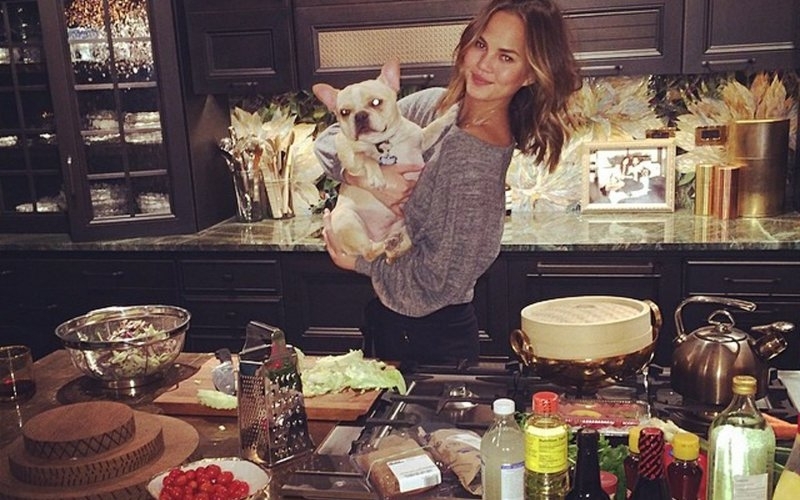 Bring on the gorgeous gourmet gal this week, the incredible Chrissy Teigen! 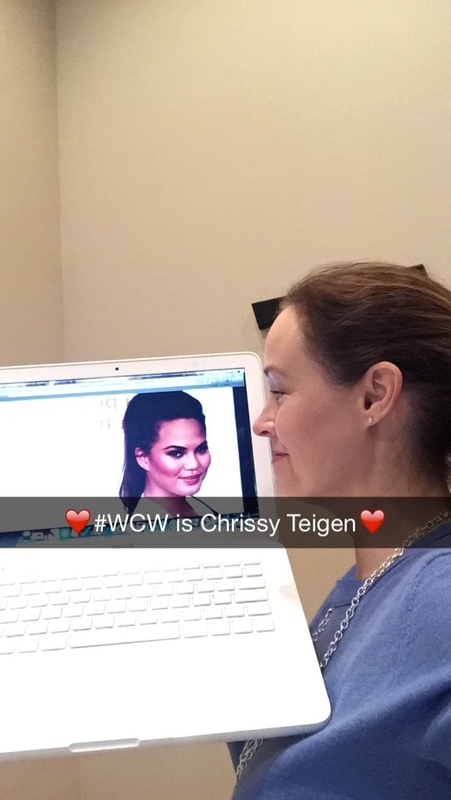 The timing for Chrissy to be this week’s #WCW couldn’t be more perfect as this multi talented lady is about to give birth. And I’m not just talking about her first baby with award winning musician husband John Legend. Yes Chrissy’s other impending birth is her new highly anticipated cookbook called Cravings. Though when you look at this stunning part Norwegian, part Thai model/chef/television host, you might not think that food is this woman’s passion. Wearing a swimsuit for the famous Sports Illustrated Magazine cover and eating decadent food don’t usually go hand in hand. But with Chrissy it works! She loves to cook and eat, and does it all with amazing charm, grace and yes even bravado! Hence she is adored by her millions of social media fans on Instagram and Twitter. Chrissy’s blog called Delushious is a love letter to food! I happen to love how it is broken down into categories “What I Make, What I Eat and Stuff You Made!” as it is very user friendly and interactive. There are so many great pics and recipes you could get lost with stars in your eyes. Of course, with Chrissy’s stunning beauty as well, it is easy to see why. Yet what is fab about her is that she and her hubby are so in love and aren’t afraid to show it. Not only inspiring to those who glimpse a pic of the two sharing some PDA, but also, Chrissy has been a muse for her hubby’s amazing songs! 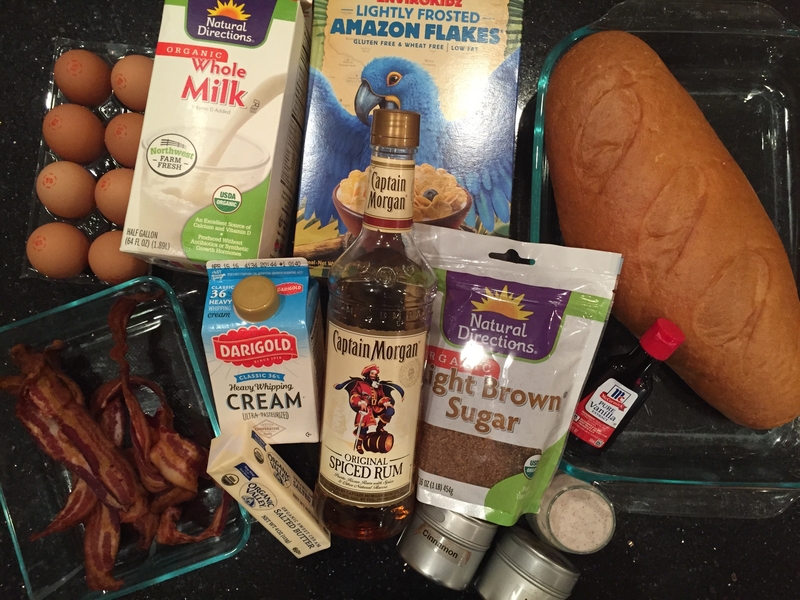 Here is a recipe of Chrissy’s that will make all of us sing! Butter a 9inch x 13inch casserole dish (or 12-inch high-sided oven-safe skillet) and arrange the cubed bread in the dish. In a large bowl, add the eggs, heavy cream, milk, rum, sugar, vanilla, cinnamon, nutmeg and salt, and mix until smooth. Pour the mixture over the bread, pressing on the bread to submerge it in the custard. Cover and refrigerate at least 6 hours and up to 12. For the Crunchy Cereal Topping: preheat oven to 350°F. 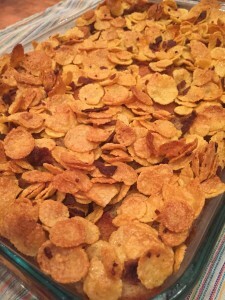 In a large bowl, combine the cereal, butter, bacon and salt, and stir to combine. Spread the mixture evenly over the casserole. Place in the oven to bake until the topping is golden and the bread cubes peeking out of the top are crusty and toasty, about 50-to 55 minutes. Okay, this casserole is so good, really now, you have to make it. It is not only easy to put together, but is also flexible, as you can make substitutions if need be. I did. My five year old granddaughter cannot have dairy, so I swapped out the cream, milk and butter with suitable alternatives. Not a problem as it still tasted fantastic. Also, if you don’t eat bacon then just leave it out. I love that the final result is so crunchy and yet soft as well. It has the perfect balance of sweet and salty. It would be great to have on a buffet brunch table with a fruit salad on the side. And the best thing is that it can be prepped in advance (up to 12 hours in fact) and then popped into the oven just an hour before you need to serve it. My kind of entertaining! Chrissy is such a fun loving person and I can imagine the get togethers at her and husband John’s home would be a blast. One look at Spike TV’s hit show Lip Sync Battle which she co-hosts with LL Cool J and you get the gist that even work is fun! The recent episode with Channing Tatum vs his wife Jenna Dewan was hilarious! Personally I had a blast singing and dancing while doing the snapchat tutorial for this #WCW recipe. 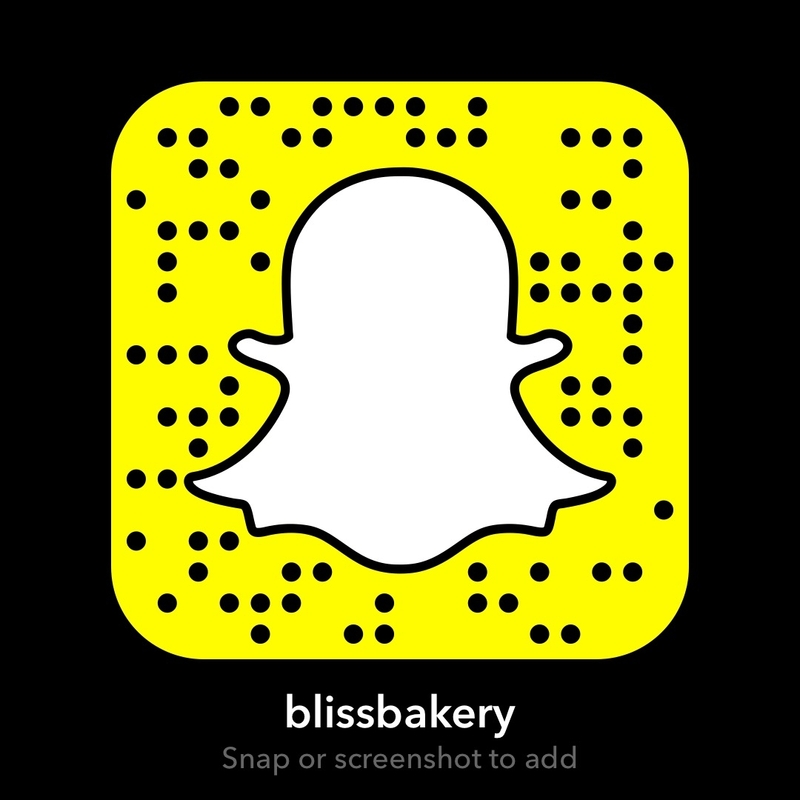 If you want to try to catch it in the next 24 hours my username is: blissbakery. Congrats Chrissy on all the great things happening in your life. Thank you for being a wonderful inspiration for enjoying food and life in general. Looking forward to many more cooking adventures with you!